The new flowSOL 1 BI (TL) is an innovative module which features a dual booster and three-level H6.5 inverter in a single housing. The Rt Hon Claire Perry MP, UK Minister of State for Energy and Clean Growth hopes to visit All-Energy and the co-located Smart Urban Mobility Solutions (SEC, Glasgow, 2-3 May). The course offering will include Battery Installation & Commissioning; Battery Maintenance & Testing; NERC Compliance; Battery Theory, Sizing around Design & Application Considerations. Courses for beginners as well as experienced technicians looking for continued education will be offered. The vision is to also deliver a curriculum that is compliant with the Institute of Electrical and Electronics Engineers (IEEE) standards. The expansion of cogeneration systems (also known as combined heat and power, CHP) has an important role to play on the road to a modern energy world. 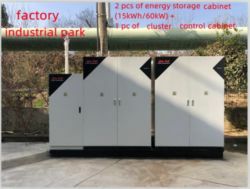 With the high efficiency of combined heat and power generation and high degree of flexibility regarding the mode of operation and plant size, cogeneration systems make a significant contribution to increasing energy efficiency at the generation stage. Following the faster and easier use of the collector and boiler databases in T*SOL 2017, the new version T*SOL 2018 now includes further improvements. More than 3,650 flat plate and evacuated tube collectors and 1,550 boilers and auxiliary heaters can be accessed. 04/05/18, 06:12 AM | Solar & Wind, Energy Storage & Grids | sonnen Inc.
MaxGen Energy Services, the leading independent solar Operations and Maintenance (O&M) company, serving a large fleet of distributed generation (DG) and utility-scale solar power plants, has appointed Billy Wang as Senior Vice President.